Maintaining healthy glucose (sugar) levels is an important part of pancreatic health. It's an even more important factor for people interested in supporting the health of their metabolic and endocrine systems. When these systems function optimally, they produce or properly use insulin, a hormone needed to convert sugar, starch and other foods into the energy that sustains life. 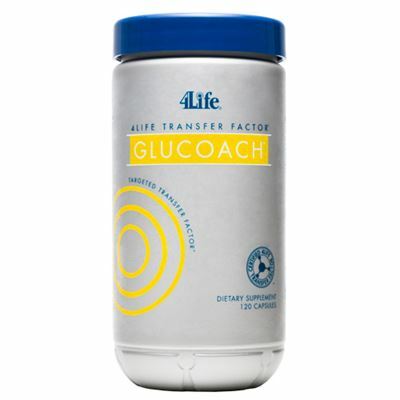 4Life Transfer Factor GluCoach supports healthy glucose levels* and the metabolic and endocrine systems. In addition to Transfer Factor E-XF™ that supports healthy metabolic and endocrine systems, it includes minerals, herbs and phytonutrients clinically shown to support healthy hormone production, improve glucose tolerance and promote pancreatic health. *For those individuals with levels already in the normal range. 4Life Transfer Factor GluCoach targets the superior immune-enhancing benefits of transfer factors to directly support the metabolic and endocrine systems. Targeted Transfer Factors can help support a normal inflammatory response within the metabolic and endocrine systems. 4Life Transfer Factor products are featured in the Physicians' Desk Reference For Nonprescription Drugs and Dietary Supplements since 2003, the standard supplement guide for physicians that can be found in virtually every physician's office, hospital, and pharmacy in the United States. Pterocarpus marsupium, momordica charantia (bitter melon) and gymnema sylvestre are all well known for supporting balanced glucose levels. Both pterocarpus marsupium and gymnema sylvestre have also demonstrated an ability to support healthy function of the pancreas. Bitter melon has been shown to support glucose tolerance and the body’s ability to process sugars. Alpha lipoic acid (ALA) has been shown to be an important antioxidant to support healthy metabolic systems and structures. ALA supports healthy insulin function in the body and healthy blood sugar levels. 4Life Transfer Factor GluCoach, Gurmar and Catalyst Plus have helped promote normal sugar levels within my body and healthy metabolic and endocrine systems. With the addition of a healthy diet, I�ve been able to lose 30 pounds as well! I have to say, my wife Dolores was right when she insisted I take 4Life Transfer Factor GluCoach. I really feel like it has supported my metabolic and endocrine systems wonderfully. This product is fantastic. "I'm so glad that I ordered the new 4Life Transfer Factor Glucoach. I've been able to enjoy eating some foods that I avoided before. This product is worth every penny. I'm recommending it to my friends and my neighbors too. Thank you 4Life." "Transfer Factor GluCoach has supported my metabolic and endocrine systems, helping me maintain healthy glucose levels."